Persisting fuel scarcity in Nigeria has led to a remarkable increase in the price of petrol. The subsidized pump price of petrol in Nigeria is N87.00 per litre. 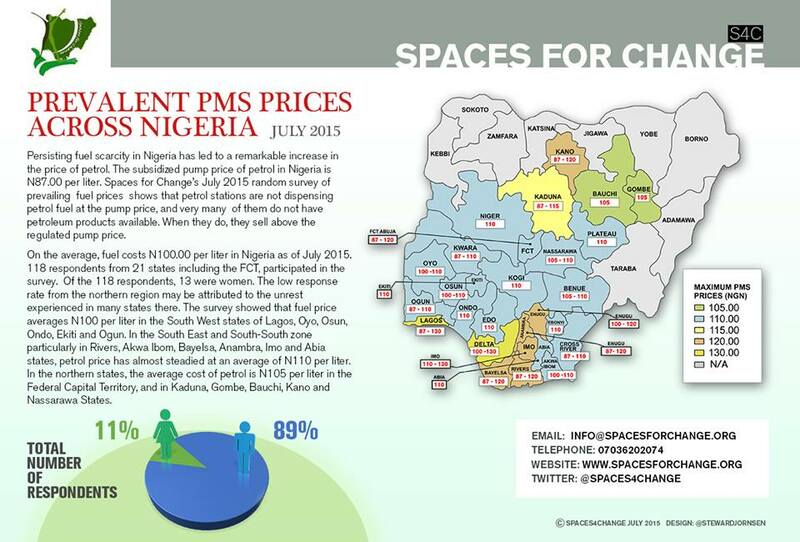 Spaces for Change’s July 2015 random online survey of prevailing fuel prices shows that petrol stations are not dispensing petrol fuel at the pump price, and very many of them do not have petroleum products available. When they do, they sell above the regulated pump price with minimal restraint from regulatory authorities such as the Directorate of Petroleum Resources. On the average, a litre of petrol now costs N100.00 per litre in Nigeria as of July 2015. The survey showed that fuel price averages N100 per liter in the South-West states of Lagos, Oyo, Osun, Ondo, Ekiti and Ogun. In the South-East and South-South zone particularly in Rivers, Akwa Ibom, Bayelsa, Anambra, Imo and Abia states, petrol price has steadied at an average of N110 per litre. In the northern states, the average cost of petrol is N105 per litre in the Federal Capital Territory, and in Kaduna, Gombe, Bauchi, Kano and Nassarawa States. 118 respondents from 21 states including the FCT, participated in the survey. Of the 118 respondents, 13 were women. The low response rate from the northern region may be attributed to the unrest experienced in many states there. Although government-owned retail stations like the Nigerian National Petroleum Corporation (NNPC) still sell fuel at N87 per litre, motorists often buy from privately-owned petrol stations at prices above N100.00 to avoid never-ending long fuel queues at these NNPC outlets. As a result of chronic electricity supply shortages, households and businesses depend on petroleum products (mainly petrol, diesel and kerosene) as alternative sources of energy supply to light up homes, carry out basic domestic chores and power the industries that create jobs. This high dependence on petrol, has forced demand for the product to increase, triggering dramatic price movements. 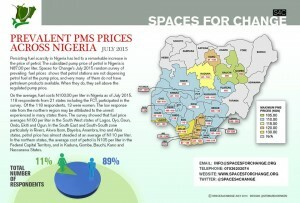 The Nigerian government recognizes that affordable pricing is central to expanding access to these essential petroleum products, and therefore subsidizes them to make prices low and within the reach of 70% of citizens living below the World Bank’s (2014) poverty line of just $2 per day. Petroleum subsidy persists as Nigeria’s four refineries with total capacity of 445,000 barrels per day function far below their installed capacities while the national oil company, NNPC, still imports refined petroleum products to meet domestic demand. Oil makes up 15% of Nigeria’s GDP and more than 80% of revenues. Production challenges in the oil sector are compounded by the dramatic decline in crude oil prices in the international market which has currently lowered to $47.57 per barrel from its previous price of $115 per barrel in June 2014. The declining oil prices informed the 2015 budget benchmark of 53 dollars per barrel with an exchange rate of 190 Naira to $1. Revenue losses resulting from lowering oil prices have prompted calls for austerity measures to be introduced.